Saint Peter (30-68AD) was one of Jesus' Twelve Apostles, and is today considered to have been the first Pope. As he was being crucified in Rome, his one dying wish was that he would one day have a starfort named after him, or at least some sort of pentagonal fort with an earthwork ravelin. He had to wait almost 1700 years, but in the end his wish was granted, and his spirit could at last rest easy. At about the same time that Saint Peter was doing his apostle thing, the Romans built a bridge over the Meuse River at what would become Maastricht. This was part of an important road from Bavay in northern France to Cologne in Germany, and Maastricht got its first city walls from the Romans, in the form of a castrum, which was built in 313. 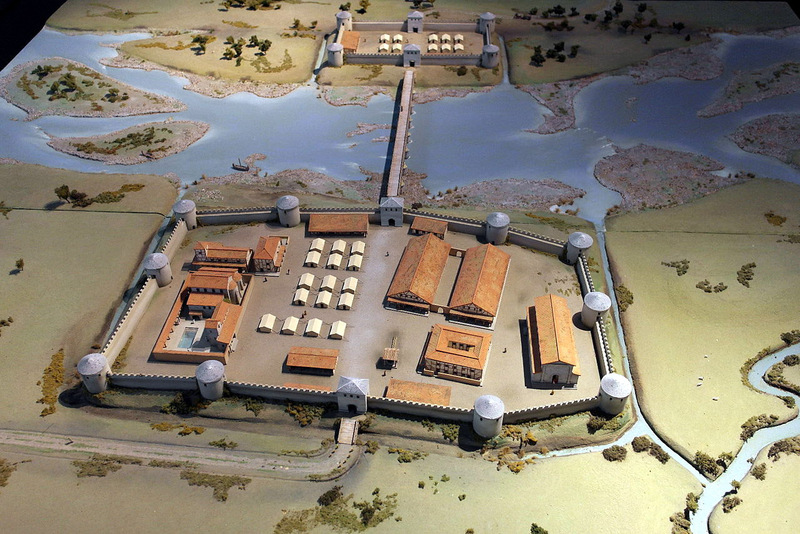 The Roman castrum of Traiectum ad Mosam (Crossing at the Meuse) in 313AD. If you wanted to cross the Meuse River, you would have to subject yourself to the scrutiny of the Roman authorities. Which was only right and proper, as it had been their slaves who had done all the bridgebuilding. Maastricht predictably grew beyond its castrum boundaries in the following years, and various parts of the city were walled...but it wasn't until 1229 that Hendrik I (1165-1235), Duke of Brabant, granted the city permission to build a stone wall around the whole enchilada for protection. This wall was completed around 1250, was about two miles in length and 18 to 25 feet high. Maastricht developed into a major marketplace for wool, cloth and leather, and everybody wanted wool, cloth and leather. 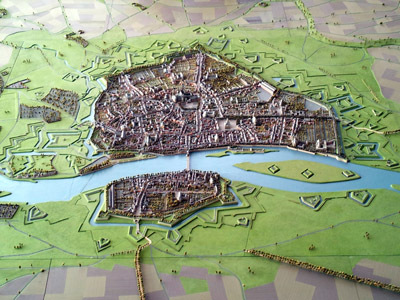 Over the next few hundred years, a series of city walls were built, which Maastricht outgrew, causing the spontaneous appearance of new walls, all in an effort to keep as much of the city protected as possible from such persons as...the Spanish. What were the Spanish doing so far north of what one would assume was their usual stomping grounds in the 16th century, one may well inquire. Having been part of the Holy Roman Empire for 500 years, the Netherlands came under the sway of the Spanish in 1522 when the House of Habsburg split into Spanish and Austrian branches. Somehow the Netherlands wound up on the Spanish side of the fence in this partition, in what probably seemed eminently reasonable at the time, but seems utterly confounding now. Spanish mismanagement of its new domain sparked the Dutch Revolt in 1568, which in turn spawned the Eighty Years' War (1568-1648). Maastricht's hodgepodge of walls didn't do it much good in 1579, when the city was besieged, captured and then thoroughly pillaged by the Spanish Army, which was led by the Duke of Parma (1545-1592). This four-month siege was highlighted by lots of digging and counterdigging under and around the city's walls, and much vicious fighting took place underground. The Spanish held Maastricht for the next 50 years, and being world-class fortification-producers, likely got a start on building its impressively starfortesque walls. The city didn't attain its peak level of fortedness until after 1632, however, when Frederick Henry, Prince of Orange (1584-1647) liberated Maastricht from the wicked Spaniard. Fed up with being pushed around, Maastricht became a bonanza of bastions, canals (wet and dry), casemates, crowns, horns, lunettes and ravelins, all in an effort to repel the Spanish should they return. 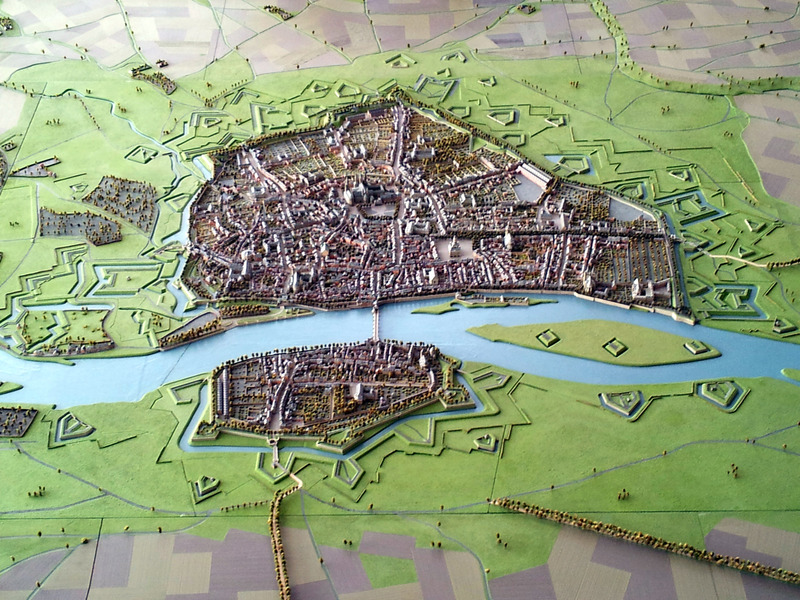 A modern, exact copy of a map that was made for French King Louis XV (1710-1774) of Maastricht's 18th century defenses. Assumedly Dr. XV would need such a map if he had unhealthy designs on the city...which of course he did, he was an 18th-century French king! Sadly, Fort Sint Pieter is not visible in this picture, it would be to the left. If it were in this picture, which, as I'm pretty sure we've established, it is not. When the imperial boogeyman returned to Maastricht, however, that boogeyman was not Spanish but French. The Franco-Dutch War (1672-1678) was held thanks to a series of weird alliances and betrayals amongst France, England, Spain and various European city-states. French King Louis XIV (1638-1715), the Sun King, marched his army past Maastricht in May of 1672, thinking to bypass the city and its seemingly impregnable walls, intending to keep its garrison bottled inside while he made his way to conquests further north. Leaving a huge fortified stronghold to the enemy behind one's expanding frontier doesn't do one's supply lines any favors, however, and Louis soon found it necessary to take Maastricht out of the equation. 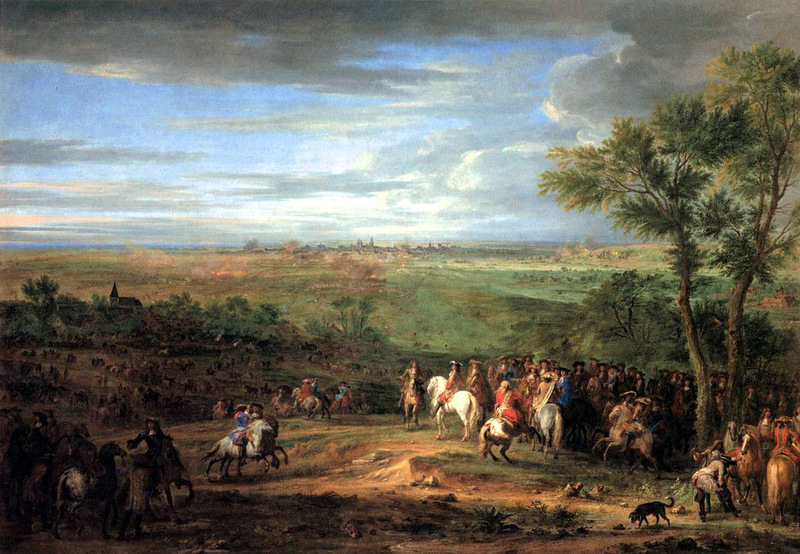 Louis XIV Arriving in the Camp in front of Maastricht, 1675ish, by Adam Frans van der Meulen (1632-1690). Louis is on the white horse. Droopy dog unidentified. 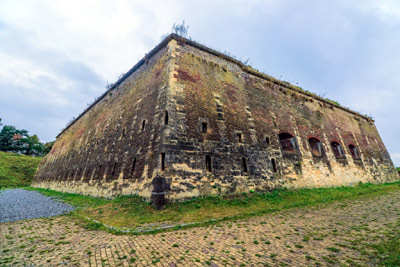 When the siege got underway in early June of 1673, Maastricht's incredible defenses worked as designed: The French spent a great deal of time and effort getting past each individual lunette, bastion and hornwork. Under normal circumstances it might have taken months or even years to reduce Maastricht's defenses to a manageable state, but present among the French ranks was a gentleman who would make an immense impact on the art of starfortey: Sébastien Le Prestre de Vauban (1633-1707). Remembered as the Father of the Starfort, Vauban also specialized in defeating those starforts that were foolish enough to resist the will of France. At Vauban's urging, for the first time a series of zig-zagged trenches were dug parallel to Maastricht's walls, angling ever closer so as to get the French sappers close enough to dig under the offending gate, while simultaneously denying the Dutch any opportunity to prevent this with cannon fire. Vauban's ingenious solution became the standard practice for approaching a fortified position of this sort for the next 200 years. Jacques de Fariaux, the Dutch commander, recognized epoch-changing offensive action when he saw it, and surrendered Maastricht to the French on June 30, 1673. 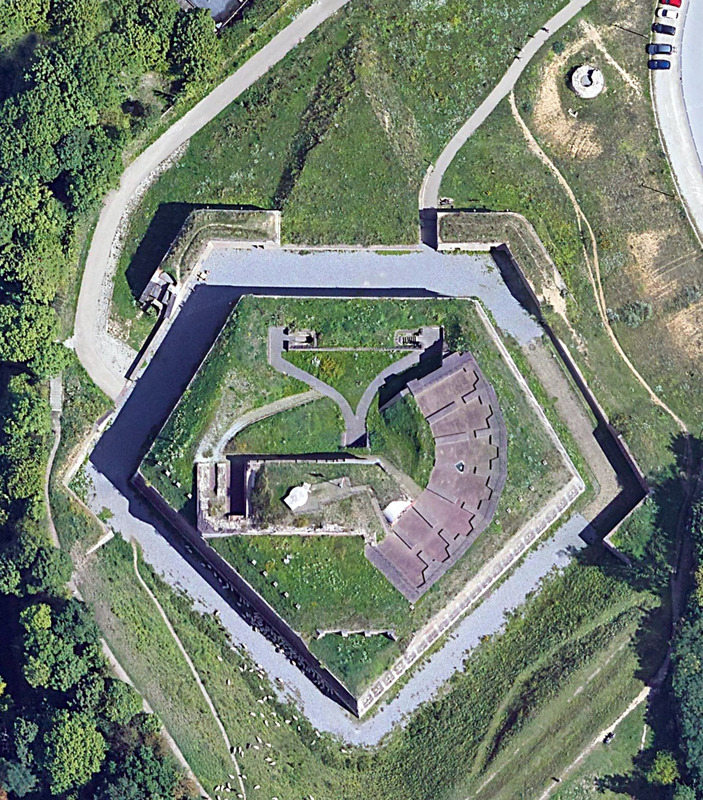 Vauban would go on to become a Marshal of France, and Louis XIV's main dude when it came to defensive fortification. He oversaw the upgrade of over 300 fortified cities and built 37 new starforts, including Fort Carré and the Citadelle de Lille. Maastricht was returned to the Dutch Republic as part of the Treaties of Nijmegen (1678, 1679), which ended the war. A series of treaties were needed because of all the parties involved (France, Spain, England, the Dutch Republic, the Holy Roman Empire, Denmark-Norway, the Swedish Empire, the Bishopric of Münster, the Most Holy Caliphate of Marrakesh, the Cherokee Nation, Korea, the Martians and some drunk guy named Hörst), each of whom felt compelled to figure out their own individual interpretation of peace. Maastricht was kind enough to leave this section of its jaw-droppingly neato 18th-century defenses intact: The Frontenpad, as it is known, is in the city's northwest section. During the Franco-Dutch War, the French had taken St. Pieter's Hill to the south of Maastricht, from which lofty height they rained artillery fire down on the city's southern walls. In 1701, Maastricht's military commander, Daniël Wolff, Baron of Dopff (1650-1718), endeavored to prevent this from happening again by ordering the construction of a pentagonal fort atop this hill...and history has finally reached Fort Sint Pieter! Whatever was left of Saint Peter's mangled corpse breathed a sigh of satisfied relief. 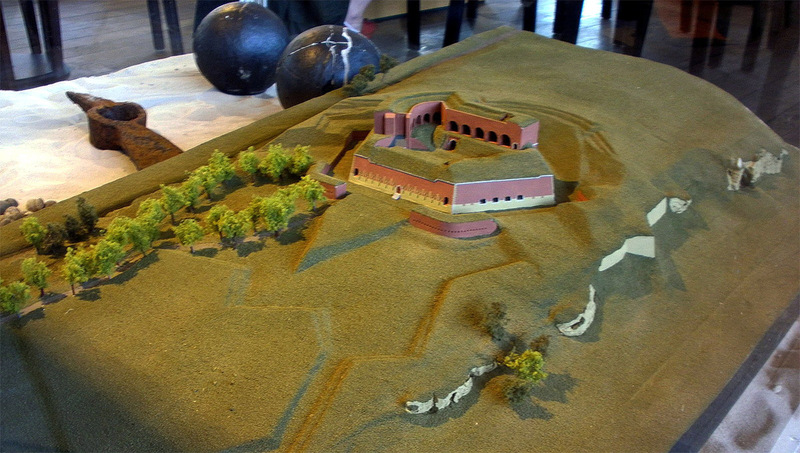 A gorgeous model of Fort Sint Pieter as it appeared at the height of its powers, in the early 19th century. In 1717, the Baron o' Dopff festively hosted none other than Russian Emperor Peter the Great (1672-1725) at Fort Sint Pieter. Peter was enthusiastic until he learned that the fort hadn't been named after him, whereupon he petulantly pursed his lips and left. Sint Pietersberg, the village for which the hill and fort are named, became internationally famous in 1766 due to the discovery there of the first Mosasaurus skull. This horrifying monster cruised the Meuse around 70 million years ago, and the skull was one of Maastricht's prized possessions...until the French took it. 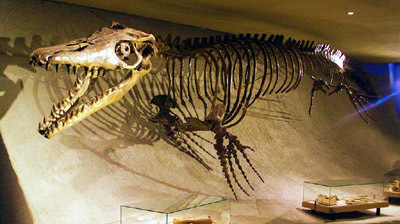 It is generally agreed today that the War of the First Coalition (1792-1797) came about due to a desire on the part of the rest of Europe to contain a blindly flailing revolutionary France...but could the French Revolution have really been just an elaborate, brilliant ploy to get Maastricht's famed Mosasaurus skull? France was eventually pounded back into its place, but the Mosasaurus skull remains, to this day, in Paris. It took the French two sieges to capture Maastricht this time around: The first took place in 1793. The Mosasaurus is very pleased to see you. 15,000 French troops surrounded Maastricht in February of 1793, and commenced a bombardment of the city. Unfortunately, Vauban wasn't there because had been dead for 86 years, so the French were still bashing their way towards the city walls on March 1, when 70,000 Alliance troops appeared and chased them away. 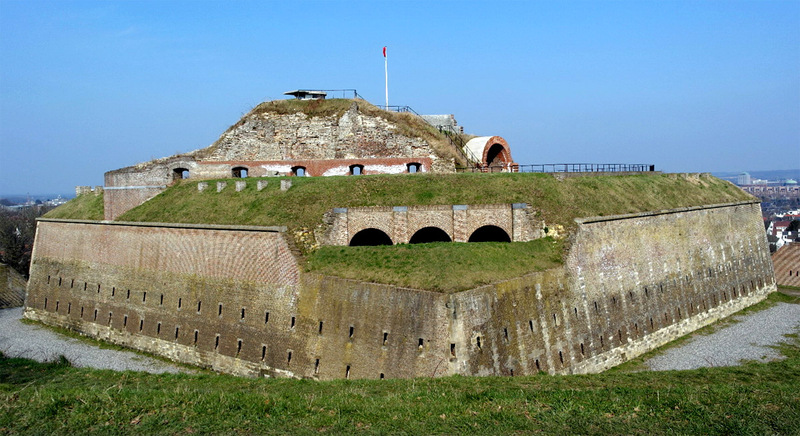 It seems likely that Fort Sint Pieter would have been involved in defending the city from the French in some manner during this siege, but if so it has gone unrecorded. Fort Sint Pieter, in 2004 before restoration, and in 2016. The French enjoyed more success in their next Maastrichtian adventure the following year. This time led by General Jean-Baptiste Kléber (1753-1800)*, 35,000 French troops began the siege process in mid-September of 1794. Things were so well in hand that, after a few weeks, General Kléber released 20,000 of his troops to fight the Austrians on the Rhine. The French dug and placed artillery and generally behaved in a threatening manner, and three entreaties for surrender were rejected by the Dutch commander on the scene, General Frederick van Hesse-Kassel (1747-1837). The French finally began their bombardment on October 31, and by November 5 enough of the city was in ruins that Maastricht's residents convinced Hesse-Kassel to surrender. 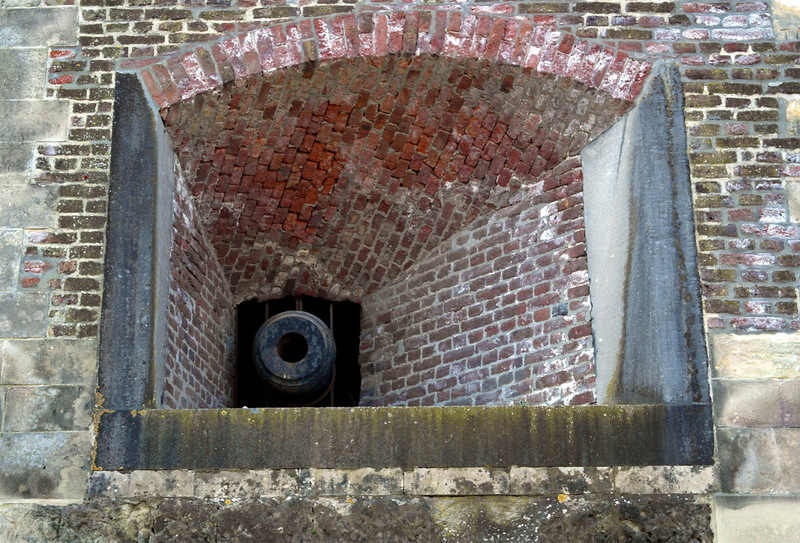 This siege did bring the French to Fort Sint Pieter. Our fort was attacked, confoundingly, from behind. The impressive earthwork that we see today on the rear side of the fort didn't exist at that time, and it had been assumed that any attack on Fort Sint Pieter would come toward the city, not from the direction of the city. The enemy, incredibly and unpredictably, had failed to cooperate. Needless to say, Fort Sint Pieter was unable to effectively defend itself from a rear attack...and this is why freestanding fortifications need to be starforts, people! I thought we'd been over this!! Maastricht was absorbed by the French Empire. For the next 20 years it served as the capital city of the French Département of Meuse-Inférieure. Fort Sint Pieter was "modernized" by the French, who added the earthwork ravelin at the fort's rear. 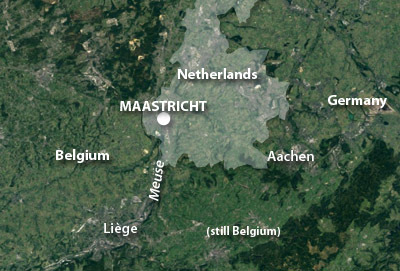 In 1815 France was finally beaten back to more or less where it had started in 1789, and Maastricht became part of the United Kingdom of the Netherlands. Events such as the American Civil War (1861-1865) illustrated to everyone who was watching that traditional masonry fortifications were incapable of standing against modern, rifled artillery. Maintaining fortifications around an entire city is ruinously expensive, and in 1867 Maastricht bowed to the inevitable and lifted its "fortified" status. 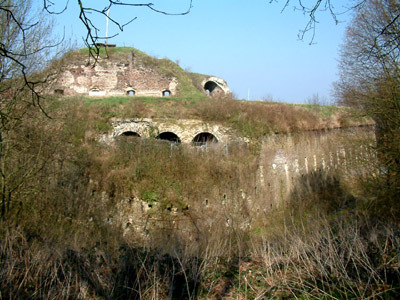 Fort Sint Pieter was, like the rest of Maastricht's vast defensive system, suddenly useless. A cafe, restaurant and "party place" structure was built on Fort Sint Pieter's northern side in the mid-20th century. These distasteful additions were thankfully purged as part of a restoration effort that lasted from 2006 'til 2014. "Très impressionnant," said the French in 1794. "Let's see what its backside looks like!" Pas aussi impressionnant. *Jean-Baptiste Kléber was stabbed to death in 1800, in Cairo. When his body was shipped back to France, Napoleon (1769-1821), for some reason thinking that Kléber would be considered a martyr (for what?? More likely Napoleon just couldn't stand anyone getting more attention than he did), had him buried at the Château d'If just off Marseilles....by which action Napoleon unwittingly made Kléber even more interesting, in that he was buried at a fort that is featured at Starforts.com! In 1838, Kléber was exhumed and returned to his hometown of Strasbourg.